There are very few life events as meaningful and (hopefully) as memorable as your wedding. It’s a special occasion that is worthy of a magnificent, no-holds-barred celebration. Given these common expectations, it is no wonder that wedding planning is notoriously stressful. This pressure also explains why many soon-to-be newlyweds opt for all-inclusive destination wedding packages. However, simply choosing to get married far away from home, doesn’t magically alleviate all the stress involved in wedding planning—but, to be fair, it does significantly reduce a good deal of the burden. Read how in this previous blog on the benefits of a destination wedding. In today’s blog, we at Dreamers Travel would like to offer some tips on destination wedding packages and how to make the most out of your destination wedding. As an experienced team of Maryland travel agents, we have helped tailor destination wedding packages for ceremonies all over the world. It’s our passion. We believe that just as no two couples are the same, their travel plans shouldn’t be either. This is why we work with couples on an individual basis to personalize a trip that is perfect for their big day. 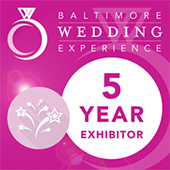 Learn more about our destination weddings and contact Maryland’s go-to travel agency today! When it comes to destination weddings, there is perhaps no bigger decision you have to make then the destination. The location not only determines the mood but also the budget and success of the event. Every place is unique, and it is important to evaluate the personality of each possible location and how that will align with you and your spouse as well as your guest—it’s also important to not forget that, for many of your guests, this may be their big vacation for the year, so keep their enjoyment in mind. If there is not one key place you and your spouse have your eye on, you don’t have to leave it up to random chance. Contact a seasoned travel agent. They can walk you through potential wedding destination packages and help find the one that best matches your needs and wants. This is without a question one of the biggest downsides of destination wedding packages—the degree of planning and commitment that is required on behalf of your guests. Most people, for example, are not able to commit to a week-long celebration in Saint Lucia with only a month’s notice. It is vital to give those who are nearest and dearest to you the time they need to calculate the costs, make necessary arrangements, and commit to being a part of your big day. Hotels, caterers, florists, and the like are all crucial to the success of your event. They, therefore, need to be properly vetted and vouched for. Ideally, you want to visit the vendors in person. However, this is not always feasible, so the best you may be able to do is arrive early enough so that you can inspect and vet. Once again, if you work with experienced travel agents, they can take care of this for you. Most have built a network of trusted vendors who have earned a reputation for excellence so that you can have peace of mind in knowing that all of your vendors are going to deliver superb services. Don’t try to take everything from your home to your destination. This is a general travel rule that also applies to destination weddings. After all, one of the big reasons for getting married far away from home is to experience something truly unique and new, right? This is why we encourage you to embrace the local setting as much as possible. This might include incorporating local flowers and decor into your decorations and opting for regionally popular foods. Also, if your destination wedding package revolves around a subtropical setting, you will want to factor this into your wedding dress decision. Doing this will not only help you make the most out of your special occasion but it can also help slash your budget. Just like with traditional weddings, destination weddings also vary in price depending on the time of the year. Choosing to have your wedding during a peak season—holidays, spring break, etc.—will likely come at a hefty price. When considering destination wedding packages, look into the major events that are scheduled to take place at your desired location. Also, look beyond venue prices and consider that during certain times of the year, say Valentine’s Day or Mother’s Day, florists, caterers, and other vendors may charge more. Though it could probably go without saying, we’ll say it anyway: the more flexible you are with your dates, the more likely you are to get a better deal. 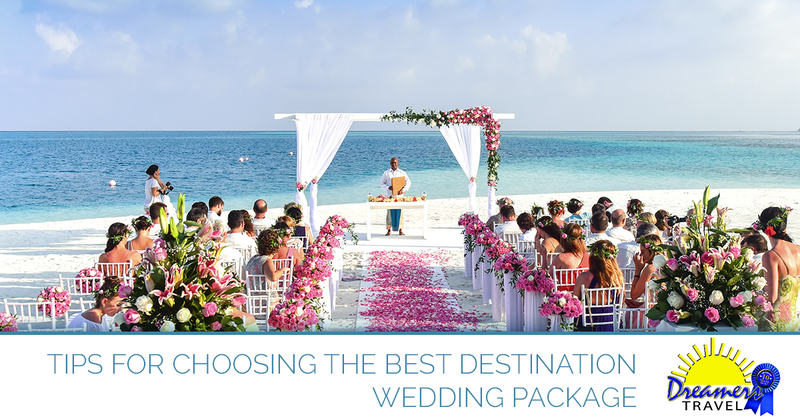 And the great thing about destination weddings is that all of your guests are already there with you, so you can have your wedding on the cheapest day possible. What difference does it make whether you have the wedding on a Saturday or a Tuesday when the whole week is a vacation? Weddings are expensive. It doesn’t hurt to ask for potential upgrades, discounts, or offers. This is especially true when opting for a destination wedding package outside of the country where haggling is an expected part of nearly all transactions. Hate negotiating? Let a professional travel agency do it for you. Travel agencies are able to leverage their industry expertise to get bottom-line deals. If this all seems overwhelming, know that you don’t have to go it alone. Working with a planner or destination wedding specialist can save you time, money, and peace of mind. They can handle most of the above issues and deal with all the long-distance correspondence, language barriers, and any other potentially stressful ordeals. If you are in the Hampstead, Maryland area and in need help planning your destination wedding, call us! Our destination wedding specialists have been helping Maryland couples pick the perfect destination wedding packages for years, and we are deeply passionate about what we do. Learn more about us and contact us today to get your free, no-obligation quote today!